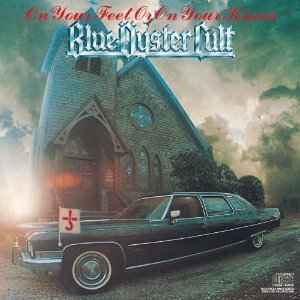 On Your Feet Or On Your Knees is the first live album by Blue Oyster Cult, recorded at various concerts in 1974 promoting the Secret Treaties studio album.It was released in 1975. Blue Oyster Cult’s speciality is melodic, guitar-based hard rock with sci-fi and occult or evil themes. The titles are often worse than the songs and may mislead you. This live album pulled evenly from the first three studio albums of their career with a couple of covers and a new song. That’s three songs from each of the first three albums. It’s a great selection but it does mean that some BOC classic early songs are left for later live albums like Astronomy (on Some Enchanted Evening) and Dominance and Submission (on Extraterrestrial Live). The album is less than 80 minutes long and it would have been nice to have seen some more songs added to it when it was remastered in 2012. They make a fantastic noise as they work their way through the set list with the guitar of Buck Dharma to the front. If you love guitar solos, then I think you will enjoy this album very much. As you’d expect, the songs are tougher and faster on this belting live album but it retains the melodies and tunes. It starts with a song that isn’t featured on the live album, Stairway To The Stars from their first studio album. Unfortunately there is then a short interview in French before it returns to BOC and Flaming Telepaths and then slowing down for the Last Days Of May. It’s a bit frustrating but you can jump ahead easily. It’s a compilation from a series of gigs on the Secret Treaties tour so it loses a mark for not representing a typical concert. Subhuman is a strange song to start with and especially as the next song starts with some big cheers and then “on your feet or on your knees, Blue Oyster Cult” as if the band are being introduced at the start of the concert. Third, the original mix of the album was muddied and I have the first version. The remastered version sounds much better from the snippets I’ve heard and I’m going to have to upgrade. The problem is, it appears to be quite hard to distinguish between the versions when you’re buying. This is rightly regarded as one of the best hard rock and heavy metal albums of the early to mid 1970s. I think a rating of 27 is about right for the original version but the remastered version should probably edge up another point. Blue Oyster Cult have regarded three highly regarded live albums – On Your Feet or On Your Knees, Some Enchanted Evening and Extraterrestrial Live – which inevitably splits the votes in the best live albums lists. I think this is their best. The Slate Readers Poll considers On Your Feet Or On Your Knees the 19th best live album ever. Reviews at Amazon are also very positive. What Do You Think About This Blue Oyster Cult Live Album? Do you think this is the best Blue Oyster Cult live album or do you think the later ones are better? If you like Blue Oyster Cult, I think you’ll like AC/DC, Black Sabbath, Deep Purple, Rush and Thin Lizzy. This entry was posted in 1970s Live Albums, Heavy Metal Live Albums and tagged 1970s hard rock, 1974 live albums, 27, Blue Oyster Cult Live Albums, heavy metal 1974 by Paul Simister. Bookmark the permalink.